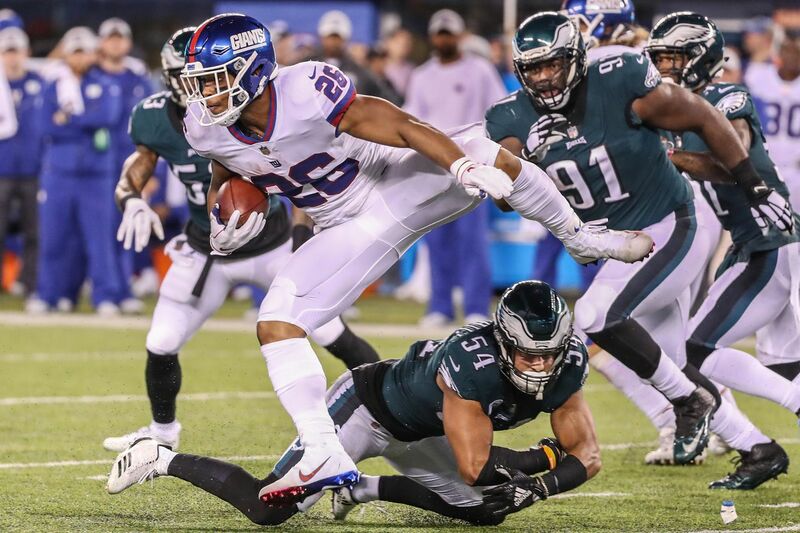 The Giants Saquon Barkley, left, jumps up to avoid the tackle of Eagles Kamu Grugier-Hill, center, for a long gain in the second quarter of Thursdays game. Fletcher Cox had him dead in his sights. Saquon Barkley had already run through a one-arm tackle attempt by Michael Bennett. But as the New York Giants running back hit the hole, Cox was ready to pounce. But Barkley stuttered-stepped and cut to his left, and the Eagles' All-Pro defensive tackle was left in his trail. Barkley was far from finished. Kamu Grugier-Hill was up next. The linebacker lunged and wound up hugging air as Barkley galloped away and onto the next hurdle. Barkley glided to the ground and somehow maintained his balance before Malcolm Jenkins charged. But he pogoed over the safety and again stuck the landing. "I just knew I had him," Jenkins said, "and somehow he stepped out of it." It took safety Avonte Maddox, who clutched Barkley's right leg, and the hustling Cox to finally bring down the former Penn State running back. And that was just a 9-yard carry. Barkley had highlight-reel runs of 46 and 50 yards — the latter going for a touchdown — and a zigzagging, 55-yard run on a screen pass in which he broke another three would-be tackles. Or were they missed tackles? Either way, broken or missed, Barkley eluded defenders 10 times on Thursday night. The Eagles, overall, averaged just six missed tackles through the first five games. Barkley looked like the love child of Bo Jackson and Barry Sanders. "He's one of the most explosive players I've ever seen," said linebacker Jordan Hicks, another of Barkley's victims. Barkley rushed for 130 yards on 13 carries and caught nine passes for 99 yards, falling one yard short of becoming the fourth rookie to eclipse 100 yards rushing and receiving in a game. But his effort was all for naught. The Eagles trounced the Giants, 34-13, despite his heroics. "Doesn't matter to me," Barkley said of his individual performance. "We didn't get the win. … As long as we get the win, I don't care if I went for however many yards or even if I went for 30 yards." The 21-year old is a freak of nature. It's already clear that he has Hall of Fame talent. He could burn the Eagles for years to come. But if the Giants don't find a quarterback, it won't matter. You can't win with a running back alone in today's NFL. The circumstances were different, but when the Eagles had a second overall pick in the 2016 draft, they selected quarterback Carson Wentz. The Giants, this past April, passed on Sam Darnold and several other first-round quarterback prospects to take Barkley. They may not have liked any of the quarterbacks, but many teams would have either traded out or taken a lineman rather than draft a running back. Jim Schwartz's defensive game plan Thursday night emphasized the importance of the passing game over the running game. He schemed a coverage that forced the aging Eli Manning to throw downfield and away from double-covered receiver Odell Beckham, Jr. (six catches for 44 yards). "Eventually they are going to have to game-plan for him or he is going to do the same thing, he is going to torch them," Beckham said of Barkley. "Their game plan was to not allow me to have any big plays, keep everything in front, safety over the top doubling." Eagles linebacker Nigel Bradham attempts to tackle New York Giants running back Saquon Barkley. Beckham missed the point entirely. Why would defenses scheme to stop Barkley if he was superhuman and the Giants still lost by 21? Schwartz didn't anticipate his defenders having as much trouble bringing down Barkley as they did, but big plays are harder to come by out of the backfield. The Eagles entered with the No. 1 rushing defense, but they had yet to see a running back with equal amounts of elusiveness, speed, and strength. Barkley once shook Hicks off his back and later slipped a Jenkins leg tackle. He broke away from cornerback Rasul Douglas on his 50-yard touchdown run. And he dodged Nigel Bradham and Jalen Mills in the open field. "He's a difficult guy to get on the ground," Jenkins said. "I know we say that on the field, but up close and personal is something different." The Eagles have a slate of games coming up against opponents with top-tier running backs. Christian McCaffrey and the Panthers will visit next week. The Cowboys' Ezekiel Elliott is on the schedule for home and away dates. The Saints have an explosive duo in Alvin Kamara and Mark Ingram. The Rams' Todd Gurley awaits in December. And Barkley and the Giants get another shot at the Eagles on Nov. 25. Manning and Beckham could rebound and make the running back that much more dangerous. The Giants defense could show. Anything is possible. Of course, the Eagles could do a better job of wrapping up Barkley. "He's big. He's powerful, very elusive," Eagles coach Doug Pederson said Friday. "His lateral movements are quick. His long speed is exceptional, as we found out, and you can't stop your feet. Any time you go against backs — same thing with Zeke and Dallas — you can't stop your feet. You've got to constantly be moving and somehow find a way to get these guys on the ground."